RM Series Roll Mills are suitable for soap refining and can also be adapted for pigment grinding and color dispersion. All product-contacted parts are made of stainless steel. There is a choice of stainless steel or hardened steel rolls. Water cooling is through a sealed system with rotary joints. The main drive is through gears which require minimal lubrication. 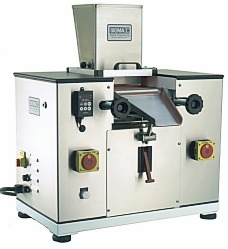 The machine is also available as an RM-4L with an extended roll length.